NCAA March Madness is in full swing and that means it’s time for our 2nd annual Wildlife Faceoff Bracket Challenge! Some of last year’s biggest contenders are back, including the 2013 champion, the polar bear. But there are some new animals in the mix this year, including the arctic fox, the Galapagos sea lion, and the zebra. How to enter: Show your favorite wildlife some love by filling out your bracket picks by March 26th. The “tournament” will start March 27th- we’ll post the wildlife match-ups daily on our Facebook page, and our Facebook Fans will vote to determine the winning animal for each match-up. How to win: The Bracket Challenge is scored just like an NCAA March Madness pool. 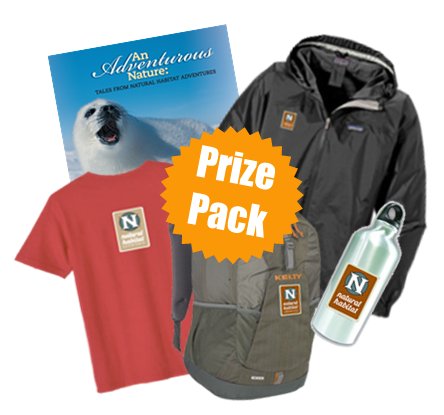 The person with the highest score (the highest number of correct picks) will win an awesome Prize Pack filled with NHA travel gear. In the event of a tie, we’ll have a drawing. Everyone can win: Everyone who enters the Bracket Challenge will be entered into a drawing to win the gorgeous 271 page wildlife coffee table book. The winners will be announced on April 8th. Good luck!